Soak the rice in water for 15-20 minutes. Wash and drain the rice and keep aside. Heat 2 tbsp ghee in a pan and fry cashews and raisins and keep aside. Add 1 thinly sliced onion and fry until brown and keep aside for garnishing. Add remaining ghee in the pan, add cinnamon sticks, cloves, cardamom and bay leaves and saute for 2 minutes. Then add 1 sliced onion and saute until transparent. Add the drained rice to the pan and fry for 3-5 minutes. Add water along with salt to the pan, mix well and allow it to boil. Then lower the heat, cover the pan and cook until the rice is cooked. Switch off and keep the rice covered for few minutes before serving. I would opt to eat this with mutton curry! Nice! Ghee rice looks so flavourful.. Very flavor rich aromatic one!! very flavorful rice. Simple but tasty. 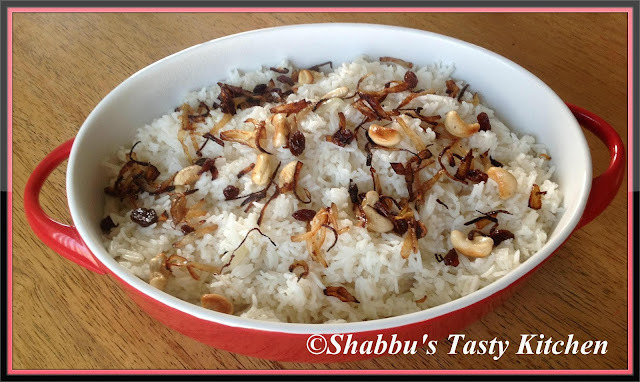 very flavorful and delicious rice...looks truly inviting!! good one dear!! My family loves this flavorful rice with curries.